If you already have some gardening experience and want to take your garden to another level, you can try some creative ideas. There are plenty of such DIY projects circulating throughout the internet- some are feasible, some imaginative while some are downright impossible to master. Here are some of the easy but attractive gardening ideas that show off your creative side. 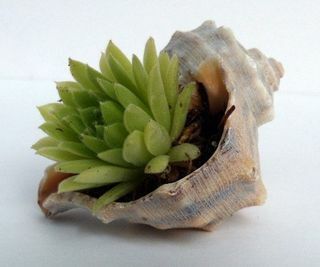 Large sea shells make beautiful pots for gardening small herbs, especially those which bear tiny, pretty flowers. You can either hang the shell using a string tied at the ends from a hook or place them on a small shelf on the wall. You can paint the shells to enhance the colors as they tend to fade with time and exposure to harsh light. Some gardeners have even tried nailing the shells to the wall, but it is best to avoid this method as it can easily break the shell into unusable (and dangerously sharp) pieces. You need to pack some soil into the shell and place some already potted and growing herbs into this soil. It's a brilliant idea to create petite gardens that will steal your heart. This is not exactly related to plants, but it can surely make your garden a lot more attractive. Take flat stepping stones and using acrylic colours, paint your favourite things. You can paint one continuous scenery and place them side by side or you can ask various family members to paint their own pictures (and sign). This creates a unique family mural across the garden. Using tiffin boxes as plant pots is an elegant and creative way of introducing plants in your own house. Use polyester tiffin boxes to make more durable plant holders. When your kids get older, their lunch boxes are seldom used. But these lunch boxes often have brightly coloured characters painted on them. So celebrate the memory of your kids’ childhood by potting a small indoor plant in it. These lunch box plants can be placed on corner shelves or tables. Or you can create a series of diagonal lunch boxes by the side of your stairs or in your living room. This is a creative gardening idea that has been used by many gardening experts to liven up their rooms. Chandeliers add a classic, vintage look to any room. But outdoor chandeliers made of plants add a whole new edge to the elegant accessory. This idea works for those who have a large enough garden to install a basic gazebo frame and canopy. It can also be installed on the porch or patio and turn in to a lovely hanging garden feature. To make this chandelier, get hold of a chandelier frame, preferably made of wrought iron. The chandelier should have large candle holders. Paint the whole thing white or red with spray paint. Now take small pots of herbs or flowers and place in the candle holders. Climbing vines bearing flowers also work as they work their way all over the chandelier. Now hang this from the gazebo frame or a hook from the porch ceiling. To work with this setting, set a table and a couple of chairs made of wrought iron and of the same colour. It would become the perfect setting for a candlelight dinner or a quiet evening with your date. However, remember to incorporate the plants potted in the chandelier in your regular garden care. Dried up or rotten plants do not make good chandelier material. When was the last time you went to the market to get a spring of rosemary or a bunch of thyme stalks? If you are an avid cook, the answer is probably not long ago. But instead of regular errands to the market, why not grow your own herbs and even vegetables right on your window sill. This way you ensure you use only the freshest produce in your food. You can take large grocery craters and mount them on an old shoe rack. Plant your herbs in these craters. You can also make a suspended herb garden by simply hanging pots from the wall or mounting window boxes planters on your window sill. These are some ideas that help you recycle old bottles, lunch boxes and utilize things you may have picked up as souvenirs on trips but never use. So put your thinking caps on and come up with your own ingenious idea.